IOWA CITY, Iowa -- University of Iowa seniors Kevin Lewis (men's cross country, men's track & field) Samantha Logic (women's basketball) and Brandon Scherff (football) earned top honors at Monday night's University of Iowa annual academic and athletic achievement banquet. 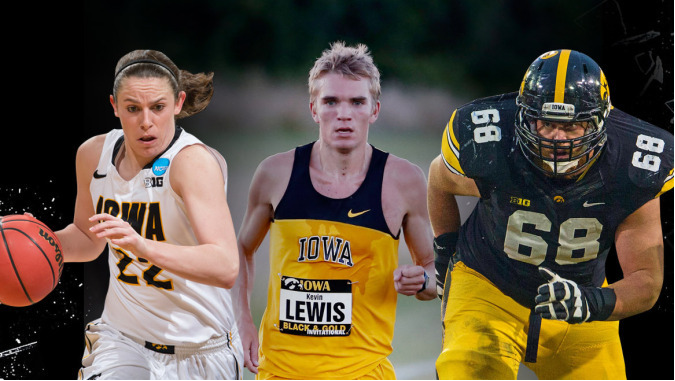 Lewis and Logic were named Iowa's Big Ten Medal of Honor winners, while Logic and Scherff were named Iowa's Male and Female Athletes of the Year for 2014-15. Lewis was a second team All-American in the 5,000 meters during the 2015 indoor track and field season, and is a two-time All-Region honoree in cross country, A native of Ottumwa, Iowa, Lewis holds the indoor school records in the 3,000 (7:57.06) and 5,000 meters (13:43.70). He also ranks in the all-time top 10 performances in six other track and cross country events. He earned first team All-Big Ten honors during the 2014 cross country season, and was Iowa's top finisher in every race he competed in the past two seasons. Lewis is a four-time academic All-Big Ten honoree. Logic, a native of Racine, Wisconsin, started all 135 games during her four-year career with the Hawkeyes, scoring 1,546 points (10th in school history), grabbing 922 rebounds (second), and handing out 898 assists (first by 322). The fourth consensus All-American in Iowa women's basketball school history, Logic is the only player in NCAA history to accumulate at least 1,500 career points, 800 rebounds, 800 assists, and 200 steals. She was drafted by the Atlanta Dream in the Women's National Basketball Association (WNBA) Draft earlier this month. She was the 2015 Senior CLASS Award winner, a Capital One Academic All-American, and a three-time Academic All-Big Ten honoree. Scherff was a unanimous consensus All-American and won the Outland Trophy, which is annually awarded to the nation's top interior offensive lineman, following the 2014 season. The 2014 Rimington-Pace Big Ten Offensive Lineman of the Year, Scherff started all 26 games over his final two seasons with the Hawkeyes at left tackle. The Denison, Iowa, native was a two-time first team All-Big Ten selection and two-time Iowa Most Valuable Player on offense. The Big Ten Medal of Honor is the conference's most exclusive award, and the first of its kind in intercollegiate athletics to recognize academic and athletic excellence. The Big Ten Medal of Honor was first awarded in 1915 to one student-athlete from the graduating class of each university who had "attained the greatest proficiency in athletics and scholastic work." Big Ten schools currently feature more than 8,200 student-athletes, but only 28 earn this prestigious award on an annual basis. In the 100 years of the Medal of Honor, over 1,300 student-athletes have earned this distinction. Logic and Scherff will be Iowa's nominees for the 2015 Big Ten Conference Athletes of the Year awards. Winners will be announced in late June, following a vote by a panel of Big Ten media voters.